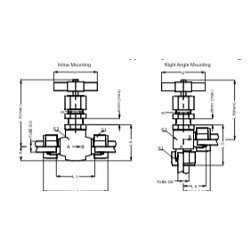 We are involved in providing a wide range of Shut off Valves Inline Mountings to the patrons.These products are available in several specifications in the worldwide market. Established in the year 2009, we, ?Global Hydraulic Fitting?, are a trustworthy organisation involved in trading and supplying Pipe, Hydraulic Gear Pump, Industrial Valve, Hydraulic & Pneumatic Cylinder, Brass Fitting, Pressure Gauge, Hydraulic Hose, Hand Tool, Pneumatic Product and Polyurethane Product. The range of products offered by us includes PVC Pipe, UPVC Pipe, Pump, Valve, many more. These are manufactured using advanced technology and high-grade raw material at the vendors' end, in accordance with the international quality standards and guidelines. Our quality experts examine these products on various quality standards to ensure their quality and eliminate flaws, if any, before the final delivery. The durability, dimensional stability, different sizes and dimensional accuracy have increased the demands of the clients across the nation.